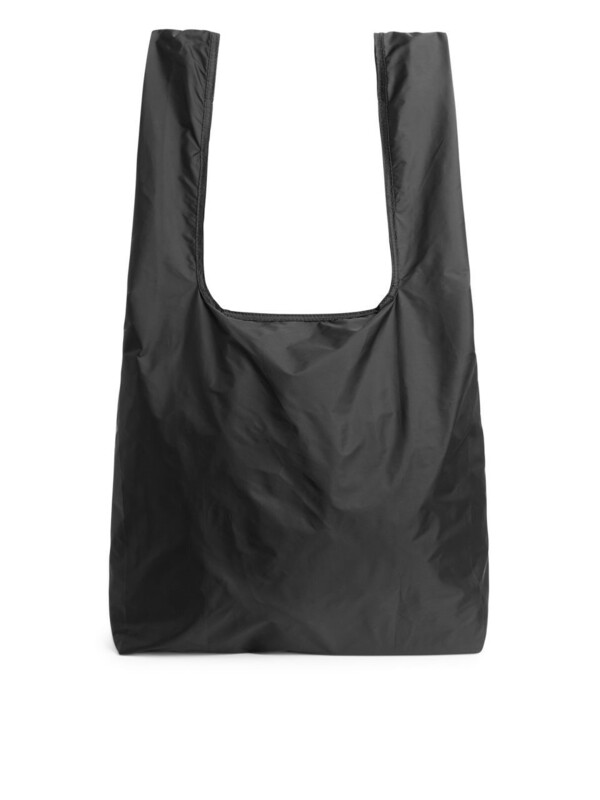 Arket – black packable shopper. 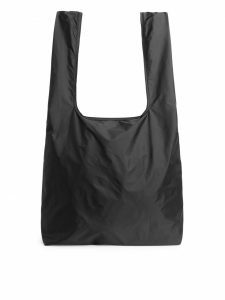 If you always have this packable shopper in your bag, it will save you and the earth a lot of plastic bags. A practical shopper that unfolds from a small snap button pocket, easy to bring along for last-minute shopping or perfect for an every-day-use. 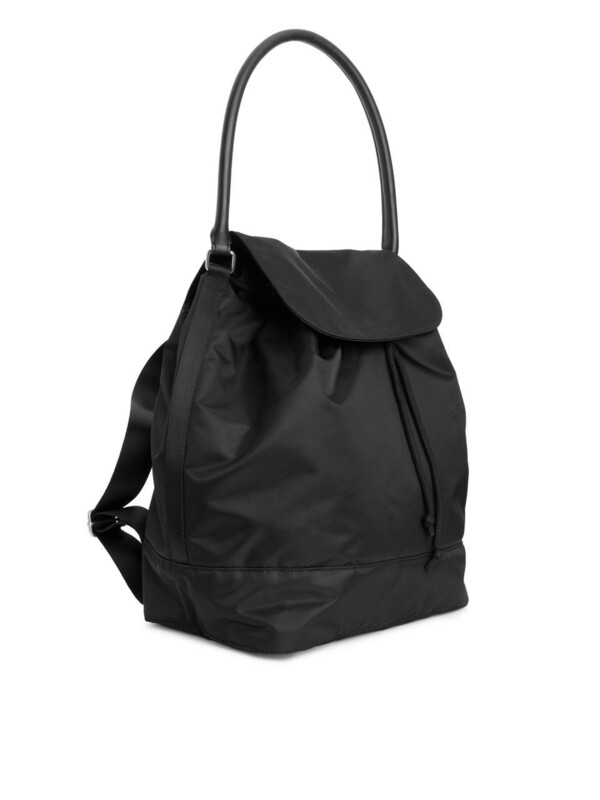 Durable and lightweight, it is crafted from water-repellent nylon fabric. Comfortably wide totes and one interior pocket with snap button to keep small items organised. Size 690 mm x 340 mm. Packed into its own pocket, the small envelope is designed to fit with other travel accessories inside ARKET luggage bags. Material: Lightweight nylon. Polyamide 100%. ID 460011-470. 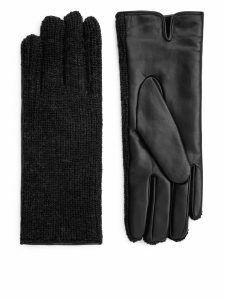 Arket – alpaca and leather gloves. 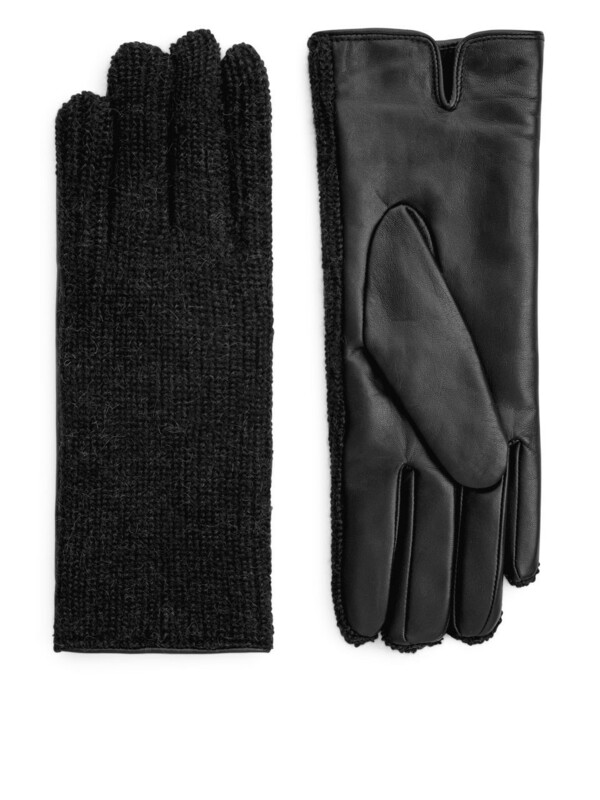 Luxurious gloves made from alpaca and leather – and with cashmere lining. With a design inspired by driving gloves, these gloves are cut from the softest leather with a rib-knitted upper part of alpaca yarn. A timeless and durable style offering smooth, comfortable wearing with a lining in cashmere blend. The leather used is chrome-free tanned. Palm: Goat Leather 100%. Lining: Cashmere 80%, Polyamide 10%, Wool 10%. Front: Alpaca 100%. ID 251025-560. 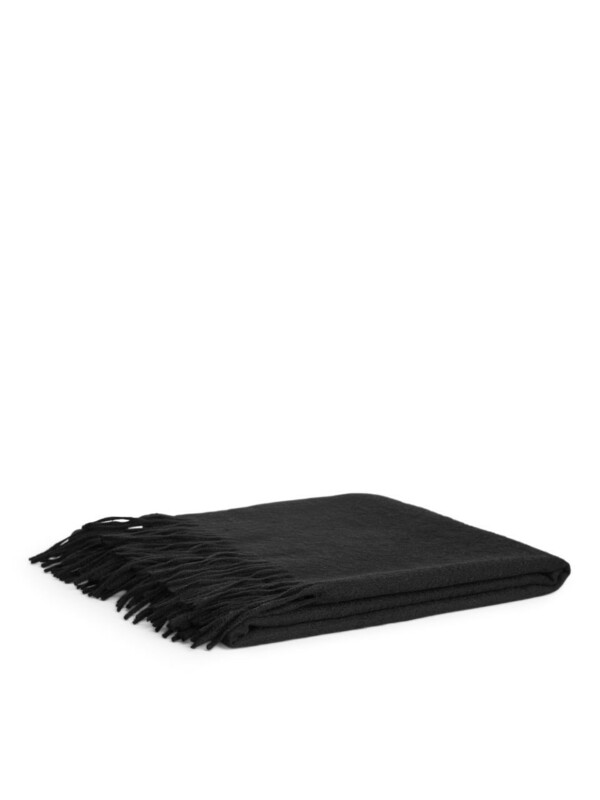 Arket – woven cashmere scarf. When I tried cashmere, I never looked back. So soft. So light. So comfortable. Use the scarf around your neck or around your shoulders. This oversized scarf, measuring 190 x 60 centimetres, is tightly woven from a silky soft, premium-quality cashmere wool, with fringes at both edges. 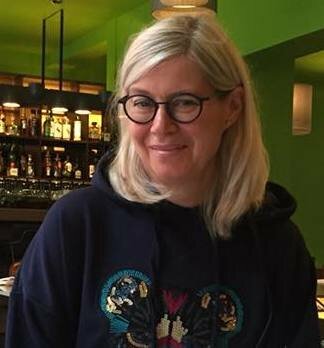 The exceptionally fine down from the cashmere goat, found in the mountainous regions around the Himalayas and Central Asia, have been used for shawls and other beautiful textiles for over 3,000 years. Also known by its Persian name pashmina, cashmere has a unique softness and warmth due to the extreme fineness of the fibres. Cashmere 100%. Arket – black alpaca mittens. These mittens will keep you warm on autumn days. 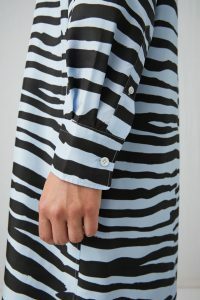 The elongated fitted cuffs is a great detail. Alpaca Mittens. A pair of touch-soft mittens knitted from a premium alpaca yarn. 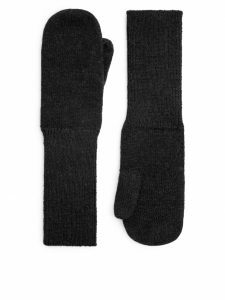 Featuring elongated fitted cuffs for extra insulation, they are an essential winter accessory with a timeless design and a durable quality. Alpaca 95%, Polyester 4%, Elastane 1%. 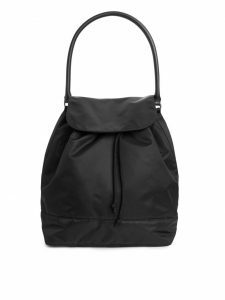 Arket – black nylon bucket backpack. 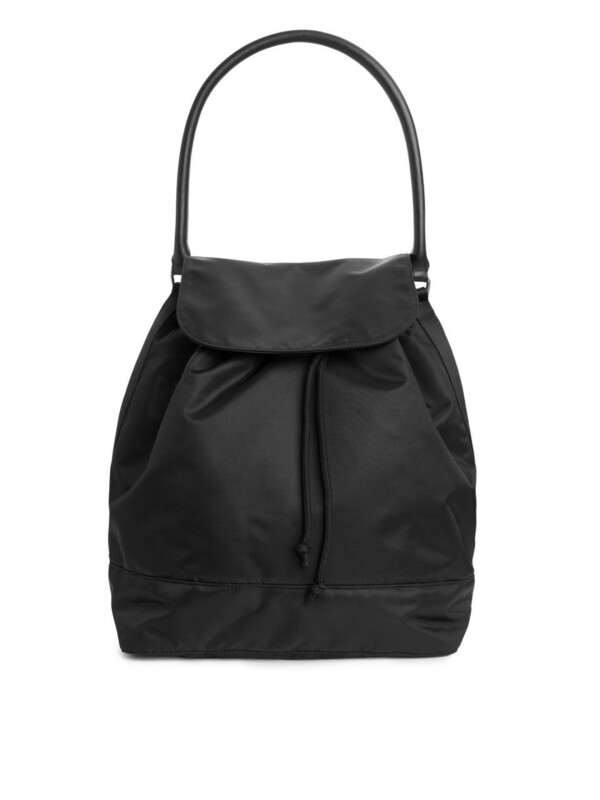 A feminine and sleek backpack. Perfect for an active city life. Nylon Bucket Backpack. Material: Cordura® nylon. Inspired by the iconic bucket shape, this versatile bag is made of durable and water resistant Cordura® nylon with a draswtring and flap closure. An adjustable strap makes the bag function as a backpack. The additional handle, crafted from chrome-free tanned leather, allows for the bag to be worn on the shoulder. Detailed with one open outside pocket and one interior pocket with zip closure. Measurements: 30 x 41 x 20 cm. Lining in recycled polyester. Padding on the inside protects the contents of the bag from impact damage. Polyamide 100%. Strap: Polyamide 100%. Padding: Calf leather 100%. Lining: Polyester 100%. ID 260018-475. 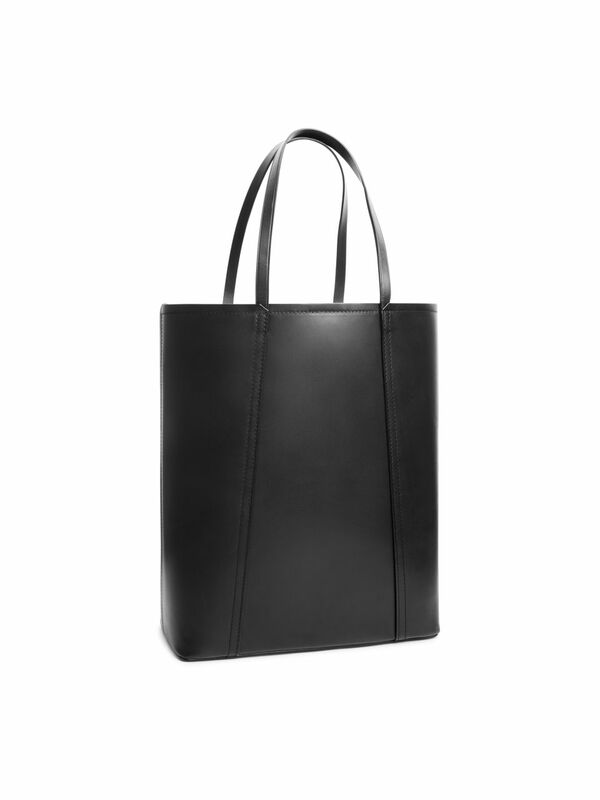 Arket – black leather bucket tote. 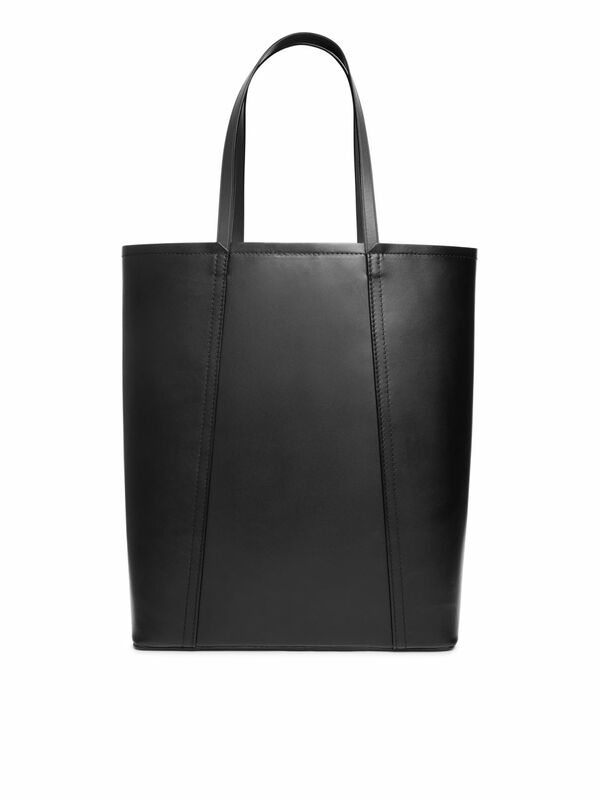 This tote could be a perfect everyday companion. It can hold everything you need during the day. Leather Bucket Tote. Made In Italy. 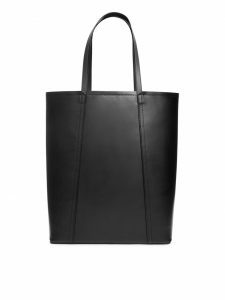 Crafted from premium-quality leather that has been chrome-free tanned, this tote bag comes in a versatile bucket style that easily stores every-day-necessities, and even larger item such as a laptop. The panels are topstitched together which adds extra detail to the bag. Hidden magnetic closure and a small inside pocket with zip. Measurements 390 mm x 320 mm x 13 mm. Handle drop 22 cm. Leather lining in contrast colour. Chrome-free tanning means that a hide is converted to leather using vegetable or synthetic extracts instead of chromium sulphate. Lining: Calf leather. Arket – black soft lace bra. A very beautiful lace bra in a comfortable design with elastic band. A triangle-cut bra with soft cups in a comfortable lace fabric featuring a sporty wide elastic band at bottom and also elastic shoulder straps. Detailed with soft boning on each side, the bra offers soft support. Adjustable two-hook closure. Narrow, adjustable shoulder straps. Polyamide 88%, Elastane 12%. Elastic: Polyamide 88%, Elastane 12%. Wing Lining: Polyamide 88%, Elastane 12%. 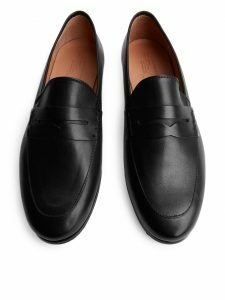 Arket – black leather loafers. Loafers are so easy to wear. And comfortable. 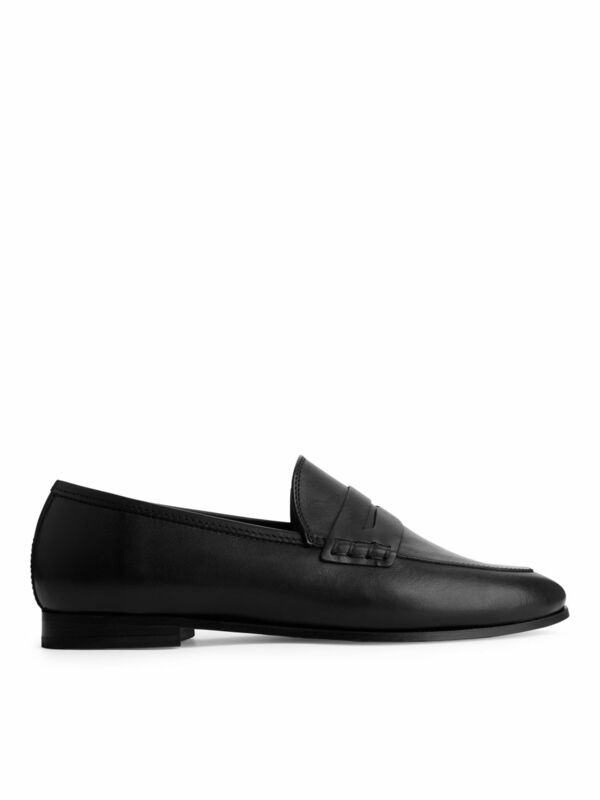 These classic loafers will be perfect for the transition period. They will look great both with bare legs and tights. A timeless flat style, designed in a half glove construction with a padded insole for soft comfort. The loafers are made from premium leather that has undergone a chrome-free tanning. Chrome-free tanning means that a hide is converted to soft and supple leather using vegetable or synthetic extracts instead of chromium sulphate. Lining in leather. Outsole in leather. Half the heel is injected TPR for anti-slip. Heel height 2 cm. Upper: Cow leather 100%. Sole: Cow leather 100%. Lining: Calf leather. 100%. ID 250020-560. Arket – wool hopsack blazer. 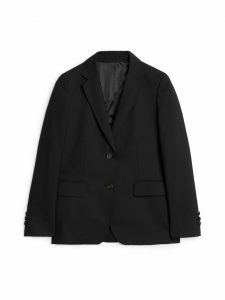 This blazer looks much more expensive than it is. 100% wool. Real value for money. Wool Hopsack Blazer. A straight-fitted blazer cut in wool fabric produced by an Italian mill. The hopsack construction – a loose basket weave with a subtle geometric texture – makes the blazer durable and airy, and naturally resistant to wrinkling. 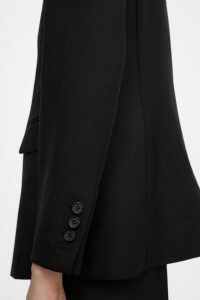 The blazer is half-lined with two buttons at front and jetted pockets with flaps. Sleeve vent with buttons. Jetted inside pocket with button. Vent at back. Wool 100%. Lining: Viscose 100%. ID 240005–166. 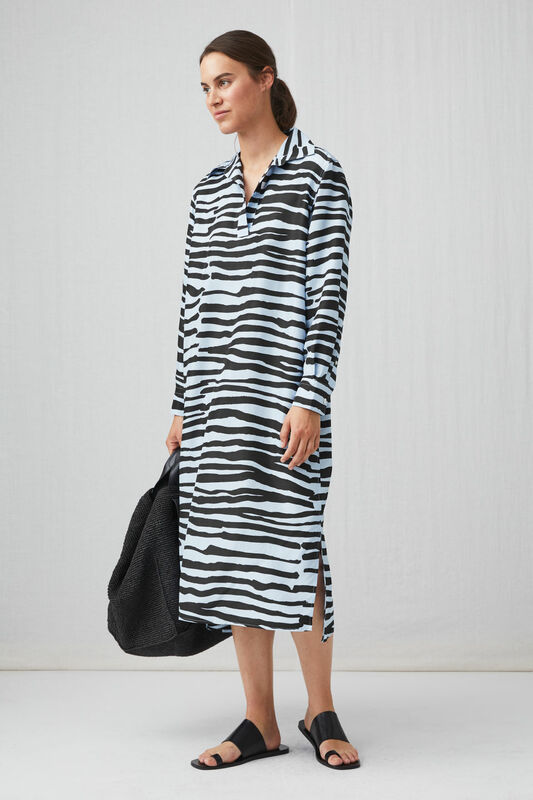 Arket – relaxed silk dress. Value for money. Interesting print and design. High quality material. 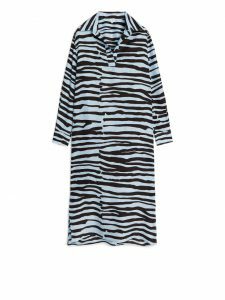 Crafted from a lustrous habutai silk fabric, this oversized dress features an all-over printed pattern. 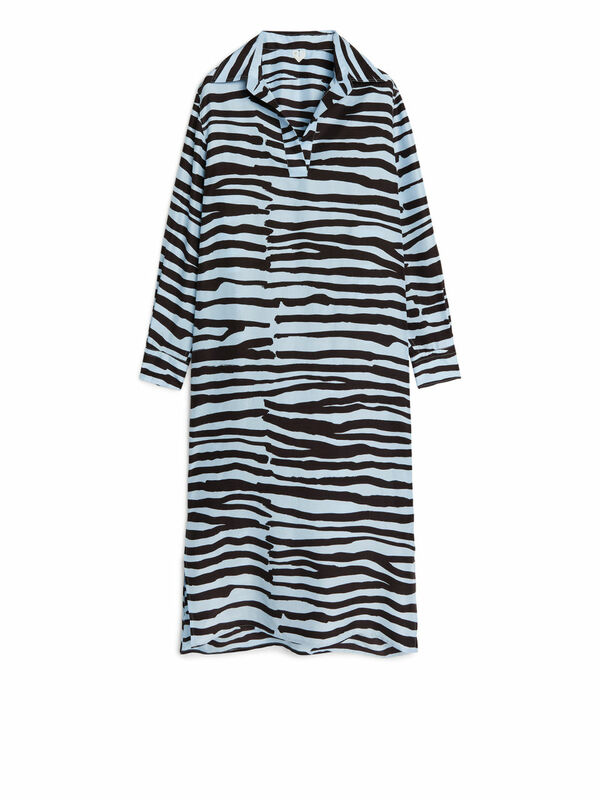 Cut at ankle-length and with a wide fit, the dress is a lightweight slip-in piece ideal for warm seasons. 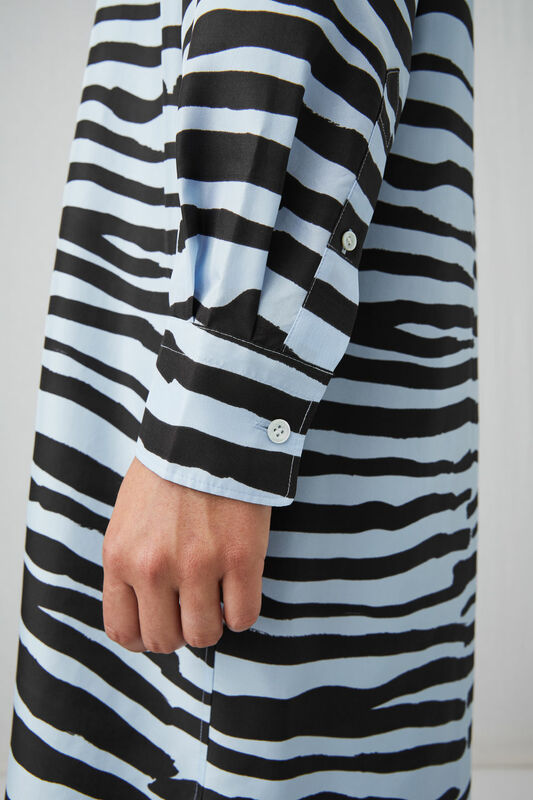 The casual shirt-inspired details – buttoned cuffs and a loose collar with a half, unbuttoned placket – make this dress a relaxed piece. Habutai silk, 14 mommes. Side slits. Mother of pearl buttons. Mulberry silk 100%.